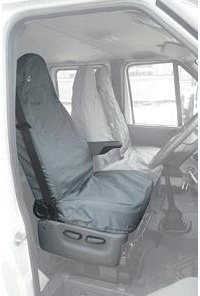 Single ford transit van drivers seat cover specifically tailored to fit. Seperate headrest cover included. Manufactured by Heavy Duty Designs. For matching ford transit passenger van seat cover see "Ford Transit Tailored Passenger Double Seat Cover" Manufactured by Heavy Duty Designs.